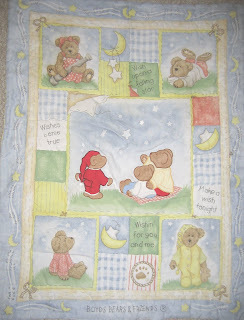 This is a baby quilt. But let's not get distracted by the babies. One of the reasons I find it so interesting is the literary perspective. Literary, you say? Yes, science-fiction. And fantasy, too! The blanket depicts a certain view of the world. On the surface, it's calm and relaxing. 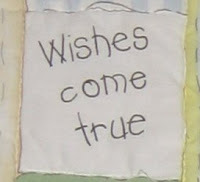 "Make a wish," the blanket urges, "and all will be well." 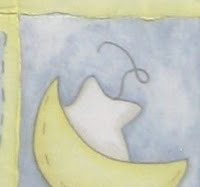 The night sky is held together by stitching? The stars are held in place by mere thread? The night sky -- the night sky -- is peeling off. Underneath is... what? Batting? 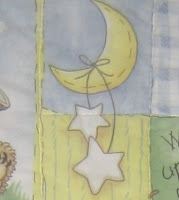 In case I'm being unclear, this is not the actual quilt that is coming apart. The quilt itself is perfectly fine. 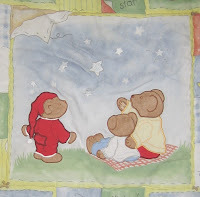 The picture that is printed on the quilt depicts the unravelling of the universe. The quilt creeps me out. Everything is fake; nothing is real. Sure, you can wish upon a star, if it makes you feel better... but even the stars aren't real. The true world underneath... is nothing-ness. It's not quite Lovecraft-ian -- no, in that case, tentacles would be reaching up through the stitching (that would be an awesome quilt!). Perhaps it reminds me most of Ursula K. Le Guin's Earthsea novels. The world is so vibrant and beautiful, but the afterlife is wholly empty. Souls go not to a heaven or hell, but to a dark, waterless land, where one stands for eternity in silent cities of stone. Shivers. That's what this quilt says. Life is beautiful now, but beyond lies Void. Well, technically the children aren't, you know, cognitively advanced enough to experience an existential crisis. I don't think we're damaging their fragile psyches. Yet.